Little Common’s footballers will have the afternoon off following a second consecutive home postponement. Common’s scheduled match at home to Langney Wanderers in Macron Store Southern Combination Football League Division One today (Saturday) has been called-off due to a waterlogged pitch. The day’s other two senior games involving local clubs, however, are set to go ahead. 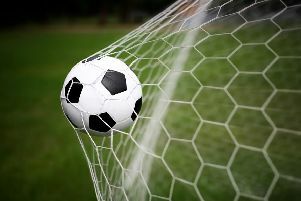 Hastings United are at home to South Park in Ryman Football League Division One South and Bexhill United go to Crawley Down Gatwick in Southern Combination Division One. Westfield’s match away to Hurstpierpoint in Southern Combination League Division Two has also been given the green light after the pitch was inspected by a local referee. The Macron East Sussex Football League programme has been affected by the wet weather, but quite a number of matches are on as things stand. See the full list below. Ryman League, Division 1 South: Hastings Utd v South Park. Macron Store Southern Combination League, Division 1: Crawley Down Gatwick v Bexhill Utd; Little Common P Langney Wanderers P.
Division 2 (2): Hurstpierpoint v Westfield. Sussex Intermediate Challenge Cup, 3rd round: Bexhill Utd U21 P Bosham P; Lindfield v Ore Athletic 1.30. Robertsbridge Charity Intermediate Cup, 1st round (1.30): Westfield II P Sedlescombe Rangers P.
Macron East Sussex League (2), Premier Division: Battle Baptists P Mountfield Utd P; Hollington Utd v Rock-a-Nore; Peche Hill Select v St Leonards Social. Division 1: Ticehurst v Wadhurst Utd. Division 2: Northiam 75 v Peche Hill Select II. Division 3: Orington v Hooe Sports. Division 4: Grasshoppers Old Boys v Conquest Utd; Hawkhurst Utd II P The JC Tackleway II P; Punnetts Town P Battle Baptists II P.
Division 5: FC Westridge P Battle Baptists III P; Icklesham Casuals II v Robertsbridge Utd II; Sandhurst v Hampden Park Utd; Sedlescombe Rangers III v St Leonards. Wisdens Sports Challenge Cup, 2nd round (1.30): Little Common III v Eastbourne Athletic. Hastings & District FA Junior Cup, 2nd round (1.30): Burwash P St Leonards Social II P; Catsfield v Bexhill AAC; Sedlescombe Rangers II v Peasmarsh Utd; Sidley Utd v AFC Hastings; The JC Tackleway v Crowhurst; Westfield III P Bexhill Utd II P.
Robertsbridge Charity Junior Cup, 2nd round (1.30): Bexhill Rovers v Hastings Rangers; Pebsham Sibex P Wittersham II P; West Hill Utd P Bexhill AAC II P.